The X class has a wide, sturdy stance with modeled surfaces to give it a muscular look. Mercedes-Benz Vans boss Volker Mornhinweg said pickups are moving upmarket, just like SUVs have done. "SUVs are elegant lifestyle products with a high-quality finish to them. Not every customer takes them into the wilderness anymore. We believe pickups could go in a similar direction," he told Automotive News Europe. Until now, Daimler's vans division has been overwhelmingly dependent on Europe, with 70 percent of its 360,000-unit volume coming from the region last year. 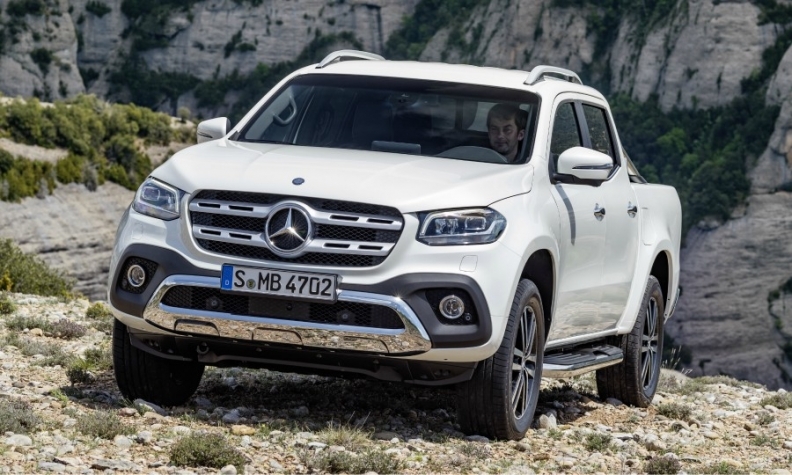 With the X class, Daimler is targeting a diverse customer group from farmers in South America, building contractors in Australia, families in Brazil, and trend-conscious individuals in Europe and South Africa. In a research note, JATO Dynamics said the X class is the first attempt to prove that the premium touch can work in a pickup. It said the model will face "several challenges" in Europe where customers consider pickups to be work vehicles and prefer smaller cars. As part of Daimler's industrial cooperation with Renault-Nissan, the X class uses the same platform as the Nissan Navara and Renault Alaskan with a conventional ladder-type frame. This reinforces the long steel support on each side to give the truck its robust construction over the unibody format used by most automobiles. Personalization: Customers who don't like an open flatbed can order an aluminum roll cover or stainless steel Style Bars, or a removable hardtop canopy that gives the pickup a more SUV-like silhouette.